One powerhouse feature of the Solo 401k is the high contribution limit. Maximizing contributions to your retirement plan can make the difference in how much you pay in taxes. Additionally, saving more money in a retirement plan can be a great way to aggressively grow your wealth. Knowing how much you can contribute is important, especially as the administrator of your own plan. However, it’s important to have a good team supporting you. Your team might include an IRS-approved document sponsor, CPA, banker, and more. In today’s CPA guest post, we asked Paul Sundin, of Sundin & Fish, PLC to teach us more about contributions in the Solo 401k plan. Retirement plan contributions can be pre-tax (traditional) or after-tax (Roth). Pre-tax contributions are tax deductible. Pre-tax contributions can help you pay less in taxes. They can lower your total taxable income, because you’ve put some of that taxable income into a tax-deferred retirement plan. 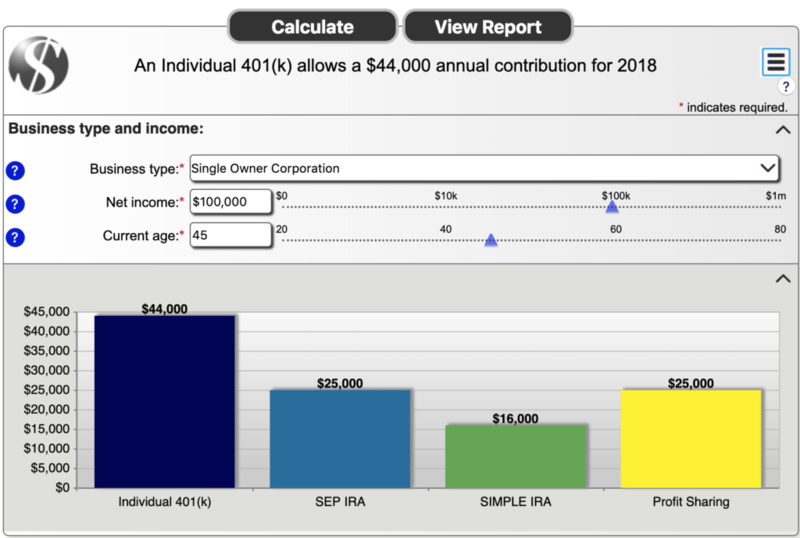 Further, the Solo 401k plan contains two types of contributions: Employee salary-deferral contributions and Employer profit-sharing contributions. If you’ve ever contributed to a 401k at work, chances are you made employee salary-deferral contributions. The money is automatically taken out of your paycheck and put into your 401k to be invested. Your employer may then “match” a portion of the 401k contributions. Employee salary deferral contributions are capped at $19,000 per year. The amount of your employer match will vary. With the Solo 401k, you can make both types of contributions because you are both the employee and the employer of your business. Employee contributions are calculated based on your earnings as an employee to the company. According to IRS rules, you can contribute up to $19,000 per year. You can make an additional $6,000 in catch-up contributions if you are age 50 or older. That brings your total employee contribution (with catch up contribution) to $25k. Employee contributions can be pre-tax or Roth (after-tax). Keep in mind the total $19k (or $25k) is capped across all plans. Therefore, if you make employee contributions to your “regular job”, you have to subtract that amount from your remaining Solo 401k employee contributions. Imagine you work 20 hours a week as a real estate professional, and another 20 hours per week at a regular job. If you make a $10,000 employee contribution to your regular job 401k, you can only contribute the remaining $9,000 to your Solo 401k as the employee contribution. Remember, your employee contributions can be up to 100% of your net compensation. If you work full-time in your small business, this can make a big impact on your taxable income. Because you can contribute up to 100% of your net compensation, the first $19,000 you make in net earnings from your business can be contributed. Therefore, if you net $20,000 per year from your business, you can contribute $19,000 of it to the Solo 401k as a tax-deductible contribution. That leaves you with only $1,000 of taxable income! Employer profit-sharing contributions are the “matching” contributions in a Solo 401k. You can contribute 25% of the net profits your business makes and pays you as a business owner. Employer contributions are pre-tax only. If you net $100k from your business, you can contribute $44,000 tax-deductible to your Solo 401k. The first $19,000 is your employee contribution and the remaining $25,000 is your profit-sharing contribution –> $100,000 x 25% = $25,000. Now let’s imagine you’re maxing out the employee contributions at your “regular job”. As you can see, you can still contribute $25,000 as an employer profit-sharing contribution to the Solo 401k. Your profit-sharing contribution amount varies slightly depending on your business structure. If your small business is a sole proprietorship or single-member LLC, you can contribute 20% of your profits. If you have an LLC taxed as an S-corp, or a corporation, you can contribute up to 25% in profits. The Solo 401k may also include a Roth component. Roth contributions are a great way to grow your money tax-free. Because you’re not getting a tax deduction on the contribution, you can take the money out tax-free. Note: funds must be qualified to be withdrawn tax-free. The employee contribution can be a Roth contribution. This means you can contribute up to $19,000 after-tax to the Solo 401k. If you are age 50 or older, you can contribute $25,000 after-tax. Unlike the Roth IRA, there are no income limits for the Roth 401k. That means you can still make Roth 401k contributions, even if you make “too much money” to contribute to a Roth IRA. Keep in mind the Roth 401k contribution is an employee contribution. Therefore, you’ll want to calculate the employee contribution against any other employee contributions you make to outside 401k plans. Business owners face an endless array of legal, tax and compliance challenges. As such, it’s important to work with a CPA or tax advisor. Set yourself up to win by working with a firm who’s comfortable with the Solo 401k. This can also help to ensure you’re making the most of your contributions. In addition to the contribute types described above, there are other strategies, such as voluntary after-tax (non-deductible) contributions. Having a competent CPA can make the difference in thousands you might pay in taxes. Tax planning for business owners has never been so important. Chances are you are paying too much in tax already. You owe it to yourself to get educated and start saving. Paul is a CPA and tax strategist. He works with clients from all over the world on tax planning and tax preparation. Specific areas of focus include real estate, crowdfunding, syndication, and nonresident aliens.